For a man of this format it is unusual to publicly expose Italy as a state in a weak negotiating position or try to act as a scaremonger. We have never seen anything remotely like that, so we think that the utterance could only serve the purpose of giving the green light to the financial markets to orchestrate an attack on Italian bonds so as to drive Italian yield up. Italy’s situation is ‘pretty worrisome’: Dijsselbloem from CNBC. He reminded the Italian government that Italian banks are a sitting target for the European financial authorities. In order to destabilize a country’s economy, one must break its backbone i.e. banks. “There will also have to be a role for the Banking authority, banking supervisor to look what this does to the Italian banks. We have already seen their stock valuation are going down” Mr Dijsselbloem said with a smile. Under the leadership of Jeroen Dijsselbleom, Greece was cut off from TARGET 2, the European payment system, so that not a single euro could be transferred abroad for a long time . Italy is not comparable to Greece, though. The state has had a trade balance surplus for years and is in better shape than France. Because Italy’s exports exceed its imports, the country is not dependent on foreign financing for its needs. The former President of the Eurogroup does not want his Brussels colleagues to have second thoughts, so he used the CBNC interview to let them know they have to proceed. This declaration of war was triggered by the Italian budget proposal. 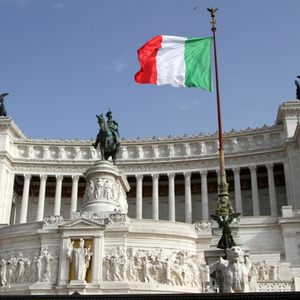 The Italian budget deficit is structural, and the state debt amounts to 130% of GDP. The Italian economy is comparable to that of Japan. Both are characterised by shrinking internal consumption and an export surplus. Just like Japan, Italy has a declining population. Demand for real estate and consumer goods is falling, so industrial production will have to eventually decelerate. The Italian government, supported by the population, refuses to submit to the European financial masters. A shrinking population and increasing public debt are inevitable and need not be a problem as long as the country produces enough to pay for its imports. It is only because the Italians do not have their currency that they are forced to obey their masters in Brussels and the bankers in Frankfurt. The introduction of a parallel currency and a withdrawal from the euro seems a logical solution and is not historically unique. Czechia and Slovakia, the former Russian and Yugoslav republics each had once a currency union, and as these countries went their separate ways, so did separate currencies emerge and replaced the old ones. Jeroen Dijsselbloem told CNBC that the only conceivable solution for Italy is money from the European support fund, although it is clear that this fund cannot solve the problems. In the end, Jeroen Dijsselbloem ventured a prediction that there won’t be any bailout for Italy because “politically and financially it won’t happen. “I don’t see support around the euro zone to say, ‘These guys are completely off track — let’s help them,’” he said, adding that a bailout of Italy would also “wipe out” the European Stability Mechanism fund within two years.” By mentioning only one possible solution, the European banker is sending a signal to Rome that no alternative, such as the return to the lira, will be discussed. We wonder what correction he has in mind. Democracy has run its course, the voters have already decided, and according to the polls they are perfectly happy with the Italian deputy minister Mateo Salvini, whose popularity is only growing. Was the former Dutch minister signaling that the European authorities would not have anything against a coup d’état in Rome? Or was he suggesting that somebody do away with Mateo Salvini?